or on any brand below. Notes: Most cigars are bought by brand name. But equally you could wish to know what is available in your favourite size, or in another flavour (main country of filler leaf). For a gift you may like to know what is available in a particular price range, in a box/packet. Click links in the appropriate block above or below. A cigar is a natural product. 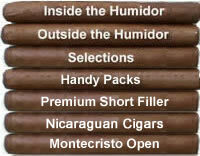 Supplies of your favourite premium cigars (especially those from Cuba) may sometimes be short. If your first choice isn't available, click to see what else is available in your favourite filler (flavour) or size. Gentle. Suitable in the morning or before a light or delicate meal. A little more taste and body - yet easy-going enough for the novice. Excellent after lunch or any light meal. Good for the cocktail hour. Pre-dinner or after a more substantial lunch - sufficiently satisfying even for an experienced smoker. Full-bodied, hearty - the perfect ending to a rich or spicy meal. Smoke with care - superb with a robust liqueur or strong coffee after a sumptuous meal, or when there is plenty of time. A demanding smoke. Click above for the full list, or on a country below. For more information "in a nutshell" read "Cigars - Smoking for Pleasure"
Extend your knowledge through Rudman's "Complete Pocket Guide to Cigars"
Relevant articles in the Archives: "Aspects of Cigar Smoking"